So many times on this Forum I and others who criticize the current Management of Disney and what we perceive as a degradation of the principles, quality, and standards which Walt and his Imagineers started, are often referred to as being "hysterical", "overreacting", and most recently, "Chicken Little". I cannot speak for others who hold the same beliefs I do, but I am not adverse to changes at Disneyland and I do not want Disneyland to be "frozen in time" from Walt's original grand design. What I am opposed to is the ever-increasing quest to minimize quality in order to maximize profits. What started as a Guest experience focus, has now pivoted into a Stockholder/Investor focus (for which, by the way, I am one). Time and again there are examples of this trend and they have been presented here and debated ad nauseam. However, the main issue and point I and others make is it's the diminishing quality and details we object to. We object to the powers that be who make the decisions are not the Artists and Craftsmen, but rather the accountants and MBA suits who are making the creative decisions. Recently I came across a Facebook Post which, in my opinion, screams volumes on the state of Management and Leadership at Walt Disney Company and what the focus, or lack of, is. Kevin Kidney and Jody Daily are designers, writers, product creators, sculptors, animators, illustrators and bloggers. For over 25 years, Kevin and Jody have contributed designs to theme park shows and attractions, from Fantasmic! to Mickey's Soundsational Parade. They are best known for their nostalgic collectibles and artwork celebrating the past. If you are lucky enough to have one of their pieces of Disney Art, then you know the quality of their work. So, now on with the reason for this post. Here is a short discussion on the topic of Management vs. quality. KS: How come we don't get unique beautiful items like this anymore? Look through the Disney catalog today and everything looks like cheap Walmart junk or an unending theme of Star Wars rebrands. I think craftsmanship is forever lost at Disney in exchange for a fast buck of mass-produced trinkets. PK: The scary part is, we're not even talking about a different era - we're talking about a decade and a half ago! Talk about rapid diminishment! Kevin & Jody: The Disney Catalog that we worked for went bankrupt and shut down within a year of management letting go of 35 artists and designers in a mass layoff. It was a maneuver intended to save Disney money but it killed the whole business. The 8 years that we worked for the Catalog was a time of great output and creativity. The artists there were amazing--all of us were huge Disney fans, and completely dedicated to the art and the Disney brand. It's a shame that was lost. Although this discussion is about merchandise, I feel it is a ongoing theme with Disney - Less for More. It's sad Disney is moving in this direction. diminishing quality and details we object to. Same time paying more for less! Spot on. From the first days of Al Lutz on Usenet, criticism of Disneyland management has been met with the accusation of "You're just against change" and "You just want Disneyland to be the same as it was in your childhood." Those of us who were adult Disneyland fans in the decades before Eisner always looked forward to Disneyland changing. We were used to Disneyland changing... for the better. Changes that gave us not only more than we expected, but more than we could imagine. The Viewliner became the Monorail. The Phantom Boats became the Submarine Voyage. Tomorrowland '55 became Tomorrowland '67. Fantasyland '55 became Fantasyland '83. Cam-and-lever figures became Audio Animatronics. The Tiki Room, Great Moments with Mr. Lincoln, Pirates of the Caribbean and Haunted Mansion were mindblowing in their day. Year after year, Disneyland was an ever-changing showcase of progress and innovation. A place of constant plussing. "Change for the better" was the standard that Disneyland management held itself to. "Change for the better" was the standard that we expected as kids, teenagers and adults. In comparison, much of the change Disney has offered under the Eisner and Iger regimes is change for the worse. Tomorrowland '67 became Tomorrowland '98. America Sings became Innoventions. Submarine Voyage thru Liquid Space became the Finding Nemo Underwater Kiddie Video. Swiss Family Treehouse became a Tarzan Disney Store display. PeopleMover became Rocket Rods, which became a ghost attraction. The Motorboat Cruise was replaced with a smoking area. Skyway -- closed. Mike Fink Keelboats -- closed. Toontown became a semi-ghost town. Tomorrowland stagnated. The Main Street Electrical Parade was replaced with the outrageously bad Light Magic. Big-name entertainment disappeared. Landmarks like Fort Wilderness and Cascade Peak were literally allowed to rot. Table-service restaurants closed. Restaurant china and flatware were replaced with paper and plastic. Unique, land-specific merchandise was replaced by generic character crap in every store. Fewer ride vehicles in operation. Fewer parking lot trams in service. Fewer CMs to handle larger crowds. The Disneyland University training program was slashed to a pathetic remnant of what it had been in the pre-Eisner years. Disneyland's world-class maintenance standards were slashed to the point where guests were killed. The average longevity of CMs dropped like a rock while turnover soared like a rocket. Year after year, a decline by degrees in every aspect of Disneyland's operational and management standards. Year after year... until it became obvious that when Eisner and Iger's Disney made a change, the result would often as not be worse than what it replaced. ^ ^ And the Golden Horseshoe Revue which ran from '55 through '86. It was such an excellent experience that made me feel like that Disneyland was a good value. -A huge decrease in hotel amenities both here and at Disneyland (i.e. Disneyland Hotel amenities like waterfalls, arcades, marina, Fantasy Water show, etc. ); generic remodels of rooms that eliminate theming (Port Orleans); getting rid of free themed newspapers (French Quarter); etc. There is still enough value -- mostly in nostalgia -- for me to keep going, but how can you argue against these and the above illustrations. Last year I posted a chart of rides/attractions from 1955-80s and from the 1980s to today. Even with Buzz, Indy and SWL, how can you deny that the second half is garbage compared to the first? I remember when unique stuff like this existed and people would have high quality Disney collectables in their homes and display it with pride. Now it is plastic popcorn holders. Indeed, now it's more important for something to be Instagrammable (even down a silly purple wall) then unique and special. People just gobble this stuff up. Guess we know we're on the right track when trolls take the time to deliberately attack us lol. One of my favorite things to do in the park is a nice, relaxing lunch on the top deck of Hungry Bear, overlooking the water, especially on a sunny day with a light breeze blowing through. If the day is right, you always have a scenic view: Mark Twain, Columbia, and canoes all exploring the river, which is peaceful and beautiful in between the gaps. I remember when Tomorrowland had the same kinetic energy: Skyway, Peoplemover, submarines, Autopia cars, monorails. Boy, was it great! As a Haunted Mansion Holiday fan, I agree with what the artists said in their post. Back when HMH was new and it's following years, there were some truly wonderful collectibles made available in the Disney Gallery and gift shop (Santa Jack Spiral Hill Statue, 13 Week Treat Pin line, Attraction Script Wall Scroll, HMH Snow globe, Stretching Room Stain Glass Windows, Ballroom and Changing Portrait replicas, etc, etc, the list goes on). Now, I realize that HMH isn't as new as it once was and maybe the dip in quality or lack of merchandise may be a result of this but Nightmare is still popular and new merchandise DOES still come out every year. It's just.. every year I step into the shop, I look for something I want and while some of the stuff is nice, I have been hard pressed to find anything that really sticks out to me or makes me want to spend the money they way I did in years past. Heck, even the Nightmare T-shirts of today don't hold a candle to the ones I used to pick up. But yeah.. that's just me throwing my rant into the mix. I agree with the mentality being rather sad, I notice it more with DCA than Disneyland and in fairness, once in a while we still really do get some nice things and I like to give credit where it is due (ex. Tropical Hideaway). It's just a shame that I find myself worrying more than I find myself being excited for many things that get announced for the resort in general. One of my favorite things to do in the park is a nice, relaxing lunch on the top deck of Hungry Bear, overlooking the water, especially on a sunny day with a light breeze blowing through. If the day is right, you always have a scenic view: Mark Twain, Columbia, and canoes all exploring the river, which is peaceful and beautiful in between the gaps. I love to do this too! Though I like to add a card game or two (Yu-Gi-Oh!, etc.) to the mix with my friends as we enjoy a meal in the top-most dining area! Love this area of the park so much. This just made me realize my problem with Tomorrowland; no kinetic energy! I used to love the land but have been unable to enjoy in the last 20 years or so. I think there is plenty of stuff we can criticize about the parks. What I don’t get is complaining about something like the Adventureland sign. The OC headline was kind of over-the-top, and that didn’t help, but wait to see how it turns out before we start bashing it. I think that’s where the chicken little stuff came about. I thought I was the only one who did that. Sadly, quiet, relaxing places around the Park are becoming fewer and fewer. It appears that if it's an area where people just want to sit and relax, Disney needs to fill it up with some type of revenue generating trap. I think all of the name calling and labeling is wrong, so I'm equally frustrated when I see people labeled as hysterical chicken littles as I am when I see others get called Disney shills or having bad taste. Respect goes both ways. As far as I'm concerned everyone's opinion here is valid and the contest over ideas is what makes MiceChat fun. As long as people stick to their ideas and not diminishing others and it'll be all good. My biggest critique in the homogenizing of the parks to emulate the business model of Walt Disney World. Every Disney theme park does not have to become a resort destination. Disneyland for example was a world class amusement park for locals and those who had to travel. I wish they made park exclusive and specific merchandise. And whoever commissions and manufactures the goodies at Tokyo Disneyland needs to be hired for the California parks at least because I really want their Chip N Dale line. It's extensive and beyond what I would anticipate and envision. I was going to post this in the "Disneyland plans to demolish and replace iconic Adventureland entry sign" thread; however, this thread seems a little more appropriate. There definitely is concern for the elimination, or reduction, of the details and craftsmanship at the Park. I for one am not opposed to the redesign of the Adventureland sign, but history has proven that nothing is safe, historically speaking. There are two particular events which sadden me. 1. 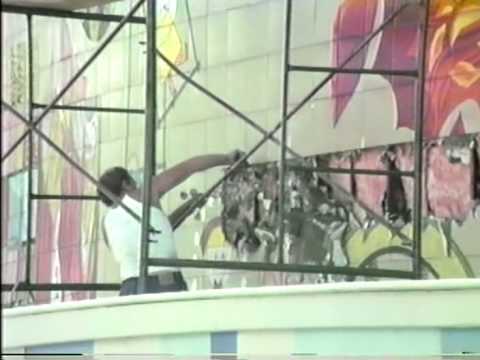 Mary Blair's Tomorrowland Mural destruction. That, as we know, was a lie. I know "lie" is a strong word, but given Marty's position within Disney, he of all people would have known he was not telling the truth. There is even a video showing the removal and destruction of Mary's work, which is tantamount, in my opinion, to someone painting over Michelangelo's Sistine Chapel ceiling. 2. Stouffer's cooking-themed mural on a wall inside the Plaza Pavilion. This was a topic covered by, ironically Kevin Kidney (see photos stovk posted above), on his blog and you can read more about it there. "Painted against a blazing metallic gold 'foil' background, the mural depicts a tree with its branches carrying an exotic array of foods from different regions of America and Europe. There are teapots and soup tureens, strings of sausages, Danish coffee cakes and a wedge of gooseberry pie. There are frog legs and crawfish, strange cheeses, aspics, and seafood in green gelatin, frothy steins of German hefeweizen, a coffee mug with a sour cream doughnut, and a silver dish of ice cream with a peach-half and a green candied cherry. Behind the food, in evocative dark brown silhouette, are cast-iron stoves and beer kegs, a slaughtered wild turkey and a flintlock blunderbuss, the disembodied head of a steer, a wooden ice cream churn and other archaic culinary implements and imagery…"
Unlike Mary Blair's mural, the Stouffer's mural, "...had not been removed or painted over, but was actually safe and sound behind the new wallpaper." And this was true…for a time. At some point, "[t]he demolition crew on the project were told to remove a wall, and remove it they did. In the process, they uncovered the mural, but not having received any official instructions on what to do with it, totally destroyed it." This I will give a benefit of the doubt to the demolition crew. However, knowing how much history is in Disneyland, things like this should not happen. Management should understand the significance of buildings, props, and art whenever dealing with renovations. In fact, just like any historical site that goes through renovations, there is always a team of Historical Archaeologists making sure the destruction of historical items does not happen. So, those are just two examples as to why I and others are very skeptical whenever renovations are made. So far there doesn't seem to be an urgency to preserve the history and significance of the artistic details in the Park. We are not "hysterical", just very suspect. Last edited by Laugh-O-Grams; 04-17-2019, 01:45 PM. Exactly. There are a few places still, but they're becoming few and far between. Furthermore, while Hungry Bear will still retain the deck, the peace of a lazy afternoon by the river will be gone with the Star Wars crowds/queues down below. Nothing like a bunch of banter and selfies and droids to spoil the Frontier/Critter illusion.